Jess Unwin learns how David Morley Architects successfully dealt with the design challenges of scale, flexibility and adaptability to create a new sports complex for the University of Nottingham. 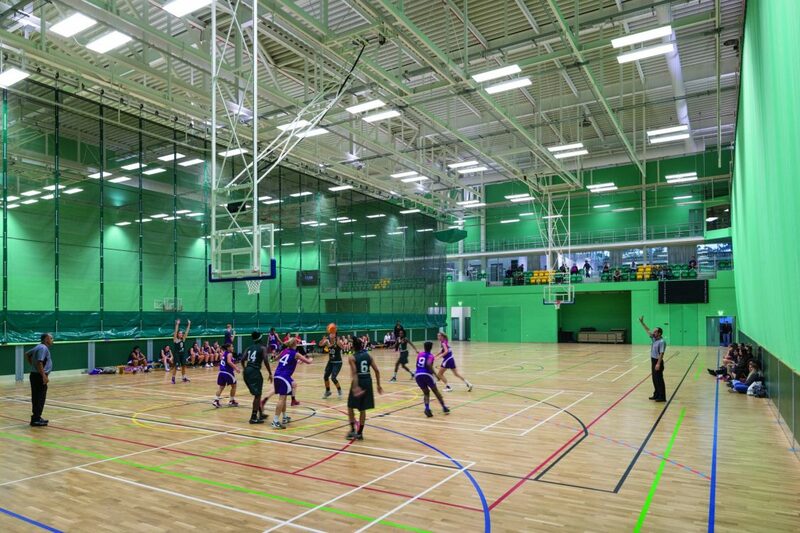 At its official opening in May it was clear that the University of Nottingham’s new £40m sports complex is a big hit – in every sense. 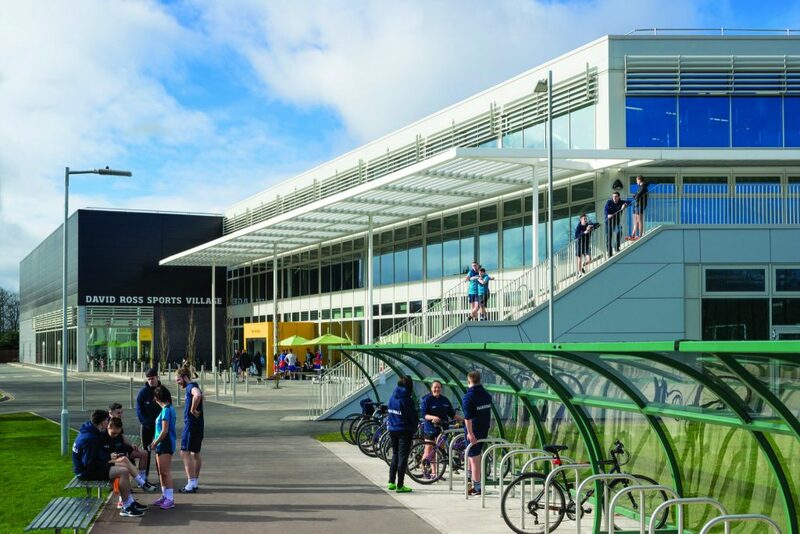 Student and public membership numbers at the David Ross Sports Village (DRSV) are growing rapidly, helped by state-of-the-art facilities that include the UK’s largest university sports hall. Yet that impressive scale – the multipurpose main hall alone can accommodate 20 badminton courts – was also one of the key design challenges which faced David Morley Architects. A not exhaustive (but certainly exhausting!) breakdown of what’s available at the DRSV underlines the wide-ranging sporting credentials of this new facility. At its heart, the sports hall can be divided into four bays if required and reconfigured to provide handball and netball courts, trampoline rigs, cricket nets and indoor five-a-side football pitches. The adjoining areas of the overall building height atrium space that also hosts the climbing wall. However, even within the Pavilion there are further sub-divisions housing a cafe, the sprint track, specialist strength and conditioning facilities and, high up on the top floor, the fitness suite, covering 1,200 m². Externally, to reduce the mass of the building, its component sections have different, stepped roof levels, while a range of facade materials also helps. The Pavilion is largely glazed, the area occupying the footprint of the former sports centre features a simple black aluminium panel cladding and the main sports hall has a light-grey aluminium cladding. The new building and the existing swimming pool now share a common reception point contain a 12 metre climbing wall, a 60 metre sprint track, a 200-station fitness suite, seven squash courts, a martial arts dojo and two dance studios. 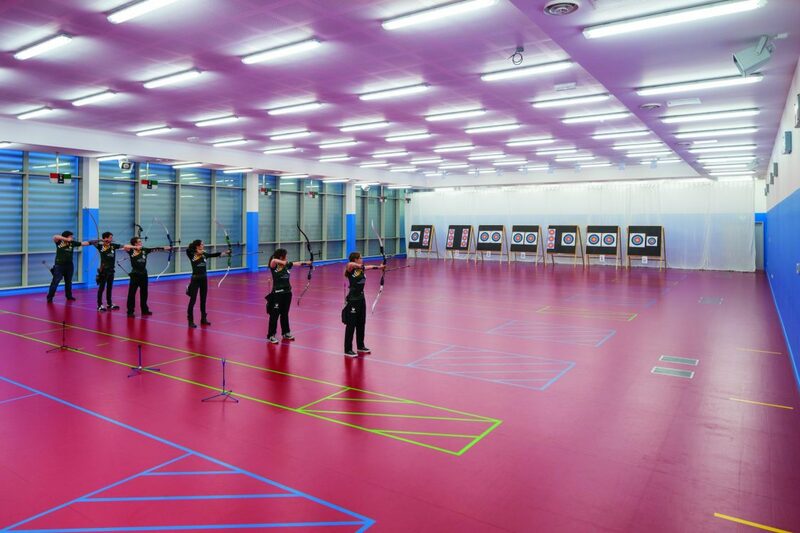 There’s also space for table tennis, archery and fencing, while other sections are home to a hydrotherapy pool, private consulting rooms and specialist physiotherapy and sports massage services. One of those distinct volumes is the Pavilion, a three-storey glass-fronted area that wraps itself around one corner of the main sports hall. Here is where you’ll find the DRSV’s entrance – a full-building-height atrium space that also hosts the climbing wall. However, even within the Pavilion there are further sub-divisions housing a cafe, the sprint track, specialist strength and conditioning facilities and, high up on the top floor, the fitness suite, covering 1,200 m2. Brick was used for the lower part of some of the building’s exterior walls, providing a robust plinth. The university did, of course, want to achieve the maximum amount of space possible for sporting activity. The answer was ensuring the main sports hall and other areas could be reconfigured for different sports. Another part of the DRSV design solution was to unify the new structure with the existing nearby swimming pool building and outdoor pitches. The pool is now connected to the rest of the complex via a covered and glazed link building, and both facilties share a joint reception point. The boundaries of the new DRSV have been built to all but touch the pitches. An outdoor viewing terrace and the trans- parency of the Pavilion’s glazing brings the outdoor and the indoor together. Roberts explains that transparency through-out the building was a further design box to tick. “Internally, glass partitions allow you to see the activities taking place in adjacent areas. It makes you aware of the facilities on offer, perhaps encouraging people to use them. Transparency into the building from outside is just as important. 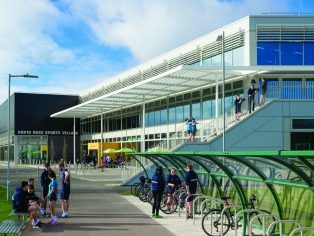 The glazing around the main approach allows people arriving at the complex to see people running up and down the sprint track, exercising in the fitness suite and scaling the climbing wall. and London 2012 water polo venue, David Morley consulted with sporting governing bodies so that spaces were designed to be compliant with recommended standards. Accessibility is ensured with internal spaces and circulation routes designed using Sport England Accessible Sports Facilities guidelines. While the DRSV’s scale sets it apart, standard construction methods – steel framework, block work walls, precast concrete slabs for the three-storey Pavilion and standing seam aluminium roofing – were employed to erect it. But it will be more than just a sports venue – the main hall being used for fresher fairs, exams and graduation ceremonies. For the latter, special acoustic treatments were applied to ensure the intelligibility of sound from a PA system in a building of such volume. Roof-mounted photovoltaic panels, mixed- mode ventilation and high insulation standards helped the DRSV achieve BREEAM Very Good. 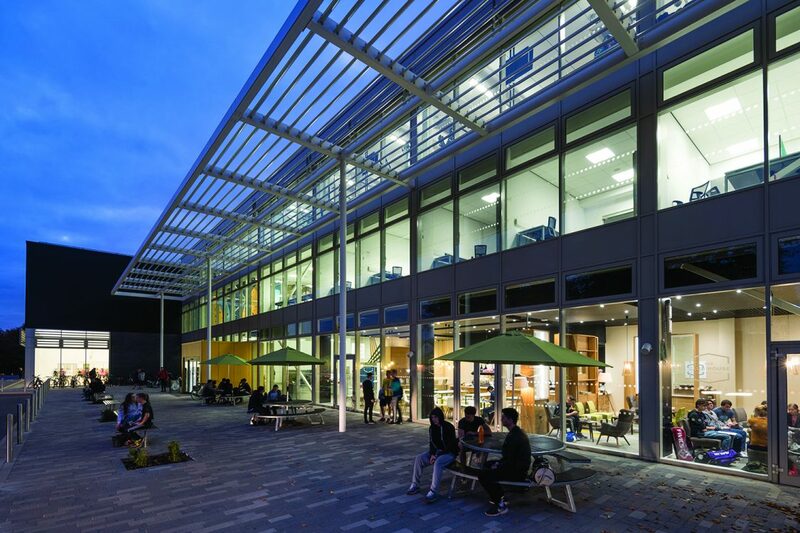 The glazing – with carefully selected solar gain protection specification – is also shaded by louvre and brise soleil features while allowing in plenty of natural light. Electric lighting, air-source heat pumps and combined heat and power boilers have been chosen for their high efficiency to minimise the building’s carbon footprint. As part of meeting the sustainability aims early design plans were redrawn to avoid felling ancient oak trees on the site, and the main contractor was able to divert 97 per cent of the construction waste from landfill. Although David Morley first became involved in the project design back in 2013, construction began in March 2015, and the building was only completed last autumn. During this period, the university used a £2m temporary sports building.